Railway Recruitment Board (RRB) conducts Exams for the post of JE which is common for all branches. Each branch has to attempt same question paper regardless of their branches. So, In this post, you will find all RRB JE Paper of 2015. This exam was conducted in 7 days and three shifts per day. 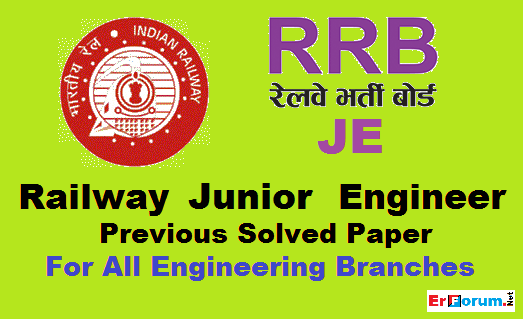 Here we are sharing all 15 Solved paper of RRB JE. Each paper is solved and is with correct answer as released by RRB. very very good for preparation. Thank you sir .. it's really helpful .. Thanks for appreciating words. Happy to know that our works helps you. Please Like our Facebook Page for more useful updates. There was combined exam for all branches with common question paper. So, no separate paper for mechanical engineering. All the other websites are making fool of us, but you seriously working for us, your work is worth apriciation. Thank u ErF. Yes. Off-course, You have to prepare basics of all engineering branches. These Papers are common for All Branches, except IT. So, IT Papers are shared separately. RRB JE EXAM is all India based. So, the exam pattern, Syllabus, Exam date etc. is common for the whole country. Please download through above links. These are common for all streams. Whether it is Electrical, Electronics, Mechanical or Civil. You have Prepare for basics of all branches. Are the question paper given above are common for all the zones or are they of any particular zone? Previously when there was Offline Exam, it will be different for Different date & for Different Railway Board. But, now For Online Exam all Board have same Question Paper on same date.